And blessed is she who believed that there would be a fulfillment of the things that spoken to her from the Lord. Mary believed, and God performed a miracle. She obeyed, and God manifested His power in her body. Her life was changed, and God inhabited the world through her obedience. She held the hand of God, and He held her heart. The World was forever changed, because a young girl believed that what God had promised would come to pass. Mary’s faith astounds me. Studying this humble woman in scripture is an effort which will always produce an imminent blessing. She endured much in her earthly life as she served her God and brought forth His Son into this world. Her song in Luke 1:46-56 shows a heart of gratitude and worship. It reveals a woman who sought God’s mercy. 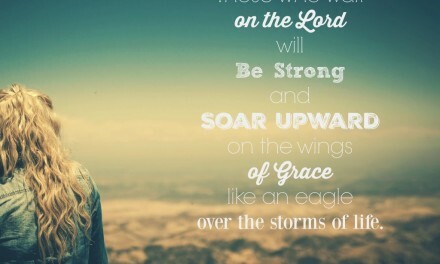 A woman who magnified God. A woman who knew who she was and trusted in who she knew God to be. I can imagine there was pain and fear in the task which she was presented with. Did she ever wonder or question the reality of this plan, bringing forth the precious baby, the Messiah… Her Savior … Her Lord. He was the answer to all their prayers; the One who would provide the way to God. What must it have been like for this young woman, humbled and chosen of God? One of my favorite Christmas songs, “Mary Did you Know?”, often leaves me asking more questions when I really think about it. Did she know what would lay ahead as she traveled to Bethlehem with Joseph? Did she perceive the pain this child would bear for our sins as she travailed to bring life into this world? Did she question her decision when the world sneered and whispered? Did she doubt God’s provision when there was no room in the Inn? Did her spirit bear witness with His as she held him close and calmed his fears? Did she wonder, with every look of a mother’s eye, what would become of this precious child, a gift for the world, not just her? But then Mary has an ‘aha’ moment. She remembered that feeling, perhaps, that knowing that you are surrounded by His presence. She had a face-to-face with God and it made her stop and think. It is like that for us, too, when we meet with God, or when He meets us in our messes. Those wonderfully magnificent encounters that we simply can’t brush away…. God-Moments. Mary had her God-moment, and once again again she began to ponder and keep these things in her heart. Belief is rising in her heart and the fulfillment of the promise is assured. Is seeing really believing as the adage goes? God in his word reminds us that the just shall live by faith. (Rom 1:17) In Hebrews 11:1, we find a definition of faith as the evidence of things hoped for and the substance of things not yet seen. 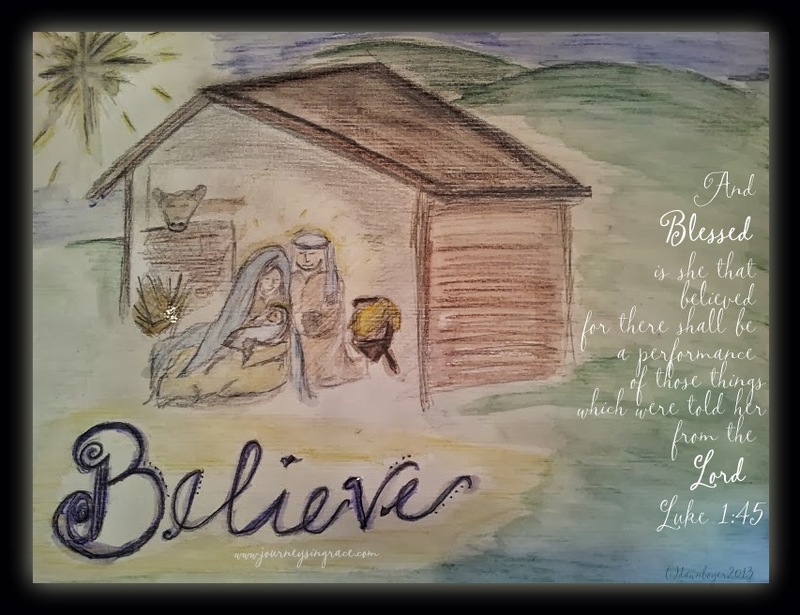 Jesus himself said, “Blessed are those who have not seen and yet who have believed.” (John 20:29) The word believe gets thrown around during Christmastide, but its significance is sometimes lost. It isn’t about believing in the spirit of Christmas as much as the promise of Christmas which should stir our hearts. Mary believed that God would fulfill that which was spoken to her. What about you? This question caught me quick today as I came to my prayer closet with a list of petitions. The longer I sat at His feet,the faster each box on my list fell short and I found myself drawn back to His Word. I realized, too, just how many things have been whispered into my heart and into my life through the faithful promises prepared long before my days were manifested, right there in His Word. And yet, I have the audacity NOT to always believe. Mary believed that God would fulfill that which was spoken to her. What has He spoken to you? To believe is to have a confident assurance that what is before you, or that which you believe in, is true or reliable. I can be fully assured, completely persuaded, that God is reliable(Duet. 32:4); that he accomplishes that which he pleases in my life for good (Jeremiah 29:11); that he will turn what is intended for bad in my life for His glory and purpose ( Genesis 50:20); and that making a choice NOT to believe is much more risky than the alternative ( Hebrews 3:19). Those breath prayers that we utter without thinking, I am convinced, are the handiwork of the Holy Spirit’s intercession in our petitioning. There is a simple clarity when we don’t ‘think’ too much. Approaching as Hebrews 4:16 reminds us, boldly in a time of need… seeking mercy, these prayers reveal the desires of our heart. Psalm 37 talks to us about those desires and the purpose God has for them. However, there is a contingency clause… we have to lean on God.. we have to Trust Him…. WE HAVE TO BELIEVE. Mary believed that God would fulfill that which was spoken to her. What do you Believe? This year, as you break bread in celebration, sharing Heaven’s joyous proclamation of the Savior’s birth, may you find that mustard seed of faith, blooming deep within the fertile soil of your heart. May faith be rooted in your heart and grow strong and true under the light which led the wise men seeking the Savior. May you be as constant as Anna and Simeon who awaited the promised Messiah’s arrival. May your joy be full as you hold the Hope of Heaven, cradled in your embrace, just like Mary held our dear Savior safely swaddled in the confines of her arms enclosing. May you BELIEVE, so that you, too, would receive the promises spoken to you . Merry Christmas with love and prayer! *All pictures, Artwork, downloads, and content on this website are the work of Dawn Boyer.